Thief Of Time is a pretty good explanation of all the inconsistencies on the Discworld. Although I think the philosophers living for centuries is funnier. And, we're back in the actual comic! In case it isn't entirely clear, the characters are talking about the notoriously confusing timeline for the Discworld series. Thief of Time, as Jane correctly claims, justifies any and all inaccuracies. See footnote on above link. Tell me the truth: Did you or did you not create this webcomic with the sole intention of promoting yourself to the Most Tropes Invoked page on TvTropes? Also, plot holes as literal holes: that could catch on fast. 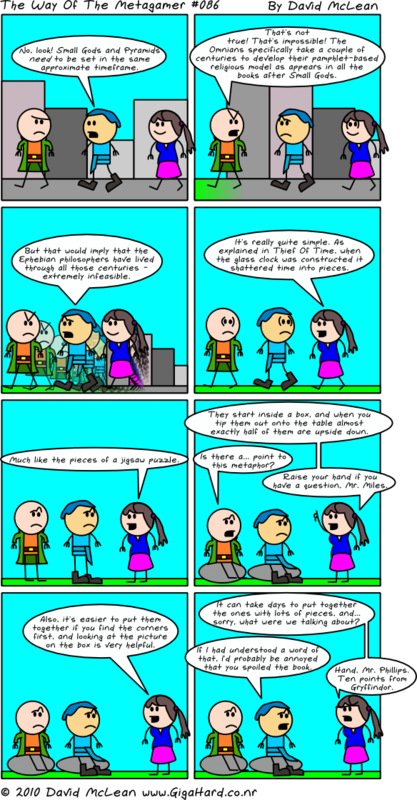 This comic was created back in 2008, well before I'd ever discovered TV Tropes. Now, I'm invoking a lot of tropes - mostly because they're good as inspiration. The rocks were supposed to appear due to Rule Of Funny, but they really should be producing a plot hole. Good thing none of the characters have pointed that out. Fred: No, look! Small Gods and Pyramids need to be set in the same approximate timeframe. Bob: That's not true! That's impossible! The Omnians specifically take a couple of centuries to develop their pamphlet-based religious model as appears in all the books after Small Gods. Fred: But that would imply that the Ephebian philosophers have lived through all those centuries - extremely infeasible. Jane: It's really quite simple. As explained in Thief Of Time, when the glass clock was constructed it shattered time into pieces. Jane: Much like the pieces of a jigsaw puzzle. Jane: They start inside a box, and when you tip them out onto the table almost exactly half of them are upside down. Bob: Is there a... point to this metaphor? Jane: Raise your hand if you have a question, Mr. Miles. Jane: Also, it's easier to put them together if you find the corners first, and looking at the picture on the box is very helpful. Jane: It can take days to put together the ones with lots of pieces, and... sorry, what were we talking about? Fred: If I had understood a word of that, I'd probably be annoyed that you spoiled the book. Jane: Hand, Mr. Phillips. Ten points from Gryffindor.